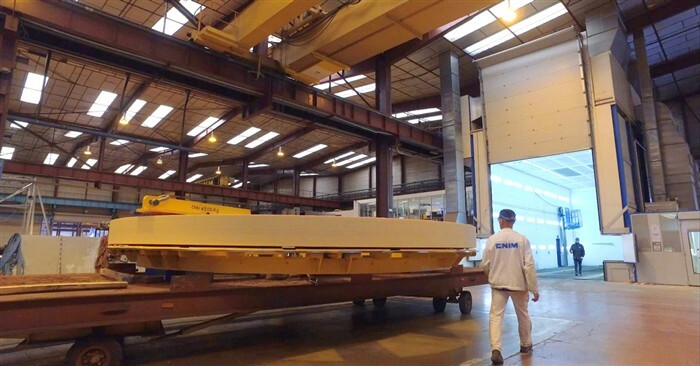 ​The F4E team is carrying out a routine inspection at CNIM (La Seyne sur Mer) before the machines are switched on to start fabricating the ITER Pre-Compression Rings (PCRs). The raw material to be used –pultrude laminate— comes from Exel, a company based in Finland. This is a genuinely European collaboration connecting north and south. The workforces have been briefed. Their mission is to produce all of the nine PCRs (six plus three spare). The prototypes produced by CNIM have responded well to the demanding tests they had to go through. Now is the time to start the production of the ITER PCRs which will be installed in the machine. The teams are under pressure to deliver the rings that will be absorb the "pressure", fatigue and deformation experienced by the Toroidal Field (TF) coils in ITER. Three of the PCRs will be placed on top of the TF coils and three below them. The main fabrication steps of these components are: winding, curing, machining, inspection and proof-testing. Basically, pultruded laminate will be wound along the trajectory of the ring. As the tooling will be slowly bending the material, a bonding tape will be applied on its layer. This helical movement will be repeated more than 150 times until the PCR consists of multiple layers which will then be cured. Subsequently, it will go through a stage of machining where excess material will be removed to arrive at the right shape and form and then it will be inspected before it undergoes a final series of proof tests. Winding kicked off late in February and during March the first curing operations started. It is estimated that by mid-2020 all nine PCRs will be completed. Angela Hernandez Sanchez, F4E Magnets, travelled to Exel to give the go-ahead for the production of raw material. "It was a turning point in the contract because we knew it was material for the real components. So there was a mixed feeling of joy and enormous responsibility," she says. Eva Boter, F4E Magnets, was at CNIM the moment the engines were switched on to start the winding operations. "It's the first of the nine that we are producing so you can imagine that we were both exited and cautious because now we are in full fabrication mode." Jacques Silva Ribeiro, CNIM's Project Manager for the PCRs explains that "F4E awarded CNIM with a build-to-print contract for the characterisation, qualification and their supply. To guarantee their performance, CNIM has implemented an innovative manufacturing process based on the use of pultruded composite material. It consists of tailored-made tooling for winding, bonding, curing, dry machining, automated ultrasonic inspection carried out at the CNIM test facility. Our teams are proud to be part of this first-of-a-kind operation." Patrick Loock, Exel Composites Segment Business Owner, explains how the company's expertise in manufacturing innovative composite products using pultrusion was key to the PCRs. "Our priority lies in developing the highest quality standards in the industry and this has allowed us to successfully collaborate with programmes which are advancing the frontiers of technology, such as CERN and now ITER. We formulated a high-performance epoxy resin system to meet the requirements for the ITER PCRs. We ensured that the 3 km long glass fibre rings met all standards and developed a customised winding tooling to manufacture them. We are proud to support the ground-breaking ITER project as it paves the way to the fusion power plants of tomorrow."